If you have read this blog for a while, you'll know that I sometimes act on impulse and sew some crazy thing just because the idea of it got into my head. In such a case, it will usually even jump ahead of my mental 'to sew' queue. This skirt is such a case. I started thinking about a pencil skirt for summer... and then about one which would be more exciting than the black twill number I made two years ago. And then, I decided to make one with crazy gathering on one side. 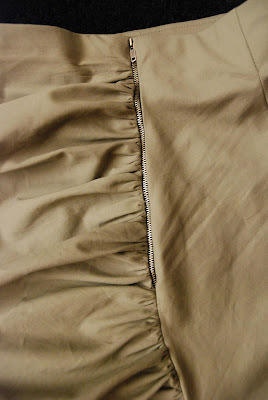 I used the same beige cotton fabric I used for last year's wide legged summer trousers. The pattern is that of a high waisted pencil skirt, slashed and spread to allow for gathers almost all over the front (I stopped about 20 cm above the hemline) and below the hip at the back. For the zipper, I used a thin metal one I found at the market recently. I bought several of these because I thought them to be fun and vintage-y. It has very fine metal teeth and black zipper tape and a length of 20 cm. I didn't have a zipper in a matching colour, so I thought I might as well add more edge to this design by using this one. I set it in like a blind zipper, without stitching on the outside. GORGEOUS!! This is one of my favourite creations of yours yet! Figure flattering, and beautifully made. I love it! What a lovely skirt on you. I like it very much, especially the fact that the fabric is downplayed and the gathers take center stage.